It has finally happened — our trampoline is no longer a place where we can have fun. 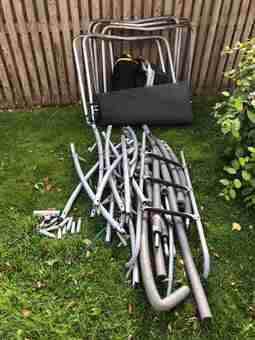 Now, it sort of looks like some scrap metal we’ve gathered and covered with a trampoline mat. It’s the end of its lifespan, and although it’s sad, now we have to get rid of it. If you’re in the same predicament, then you’re probably wondering where to dispose of a trampoline and how the whole trampoline removal process goes. Luckily, we have a few useful ideas. These will certainly help you learn how to get rid of your trampoline fast and effortlessly. Although we have to dispose of our trampoline, that doesn’t mean its parts cannot find a good home elsewhere. Since the trampoline frame is usually made of metal, we could dismantle the whole trampoline and try to sell the frame as scrap metal. This is a fine way of getting rid of it effortlessly. At the very least, it won’t feel as if we are just throwing our money down the drain. Moreover, some people love tinkering, so they might even want to use the trampoline for a DIY project. The first thing we would have to do is secure the area. We should make sure our kids are someplace else and then start dismantling the trampoline. First, we have to remove the mat. If we want to sell the trampoline, we ought to check it for rips. Then, there’s only the frame, the springs, and the safety pads left. What we could do is get the instruction manual we got when we first bought the trampoline. Since we probably had to assemble it ourselves, then it’s a good idea to go in reverse of the assembly process. 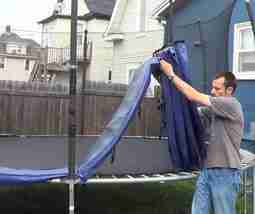 We should remove the last parts that were assembled FIRST to ensure a smooth trampoline removal. For the removal process, we’ll need a spring puller, a rubber mallet and a screwdriver. Also, if the frame is a bit stubborn, then we can use some penetrating oil to loosen it up a bit. In most cases, if the trampoline is too old to be sold or given away, then we’ll just have to dispose of it by selling it as scrap metal or recycling it. 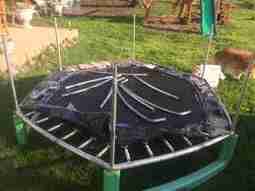 The local recycling plant will tell us in what kind of condition our trampoline should be if we want to recycle it. They’ll also tell us how we should dismantle it or break it down. The best part about this is that we might be able to receive some recycling credits or cash for the metal parts. There are various places where we can dispose of our trampoline, but our regular trash can is not one of them. Since our trampoline is probably really old or big, then we will first have to break it down and take it somewhere away from our home. Like we’ve already mentioned, a local recycling plant is a good idea. However, we could also advertise on some websites and ask whether someone would like to have it. Plenty of people are avid tinkerers, so they might want to turn it into a greenhouse or something similar to that. The bigger the trampoline, the harder the trampoline removal process. 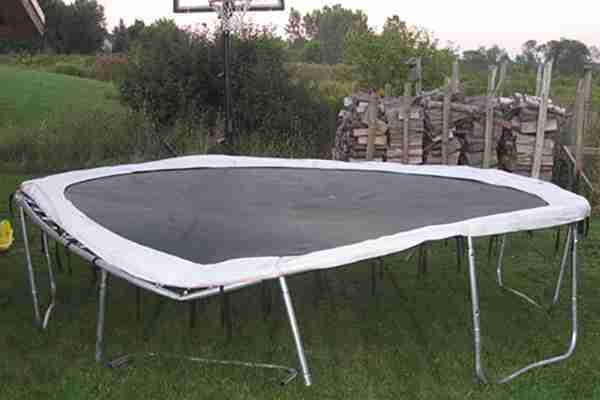 If we want to dispose of a large trampoline, it’s a good idea to call in a couple of friends and ask them to help us. These sorts of trampolines are too big for one person to handle. Most of the parts, even when dismantled, are really heavy. But the process of dismantling it or breaking it down is practically the same. We ought to remove piece by piece and ensure that we don’t cut ourselves on some broken parts. A pair of heavy-duty rubber gloves could come in handy here, just in case the trampoline is not only large but very old as well. Hopefully, now you know how to get rid of your trampoline and ensure the trampoline removal is a real breeze. But if you think that everyone should learn more about this topic, make sure you share our article. And of course, if you have some additional advice and would like to share it with others, please do! Our comment section is waiting for your feedback.